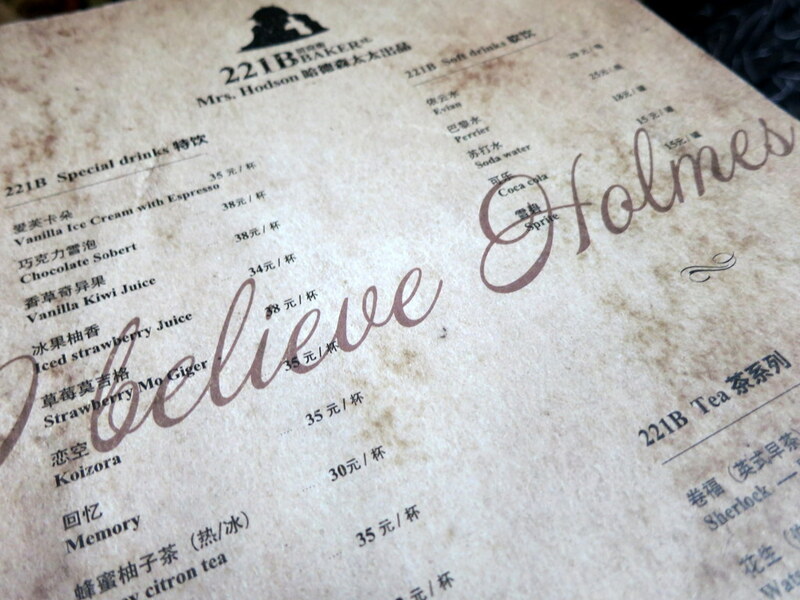 221b Baker Street (福尔摩斯主题咖啡馆 ｜ Sherlock Holmes Themed Cafe) was a short (10 minute) walk from the South Shaanxi Rd Station off of line 1/10. If you like quirky themed cafe’s, Sherlock Holmes, or just cozy cafe’s in general, this is worth the trip. The cafe is relatively large—but already seems to have quite a following (which was surprising because I had trouble finding information about it on any of the standard Shanghai activity sites)—so finding a seat can be tricky. Luckily we hung out just long enough to score a cozy nook complete with a couch and coffee table made out of two old leather suitcases. 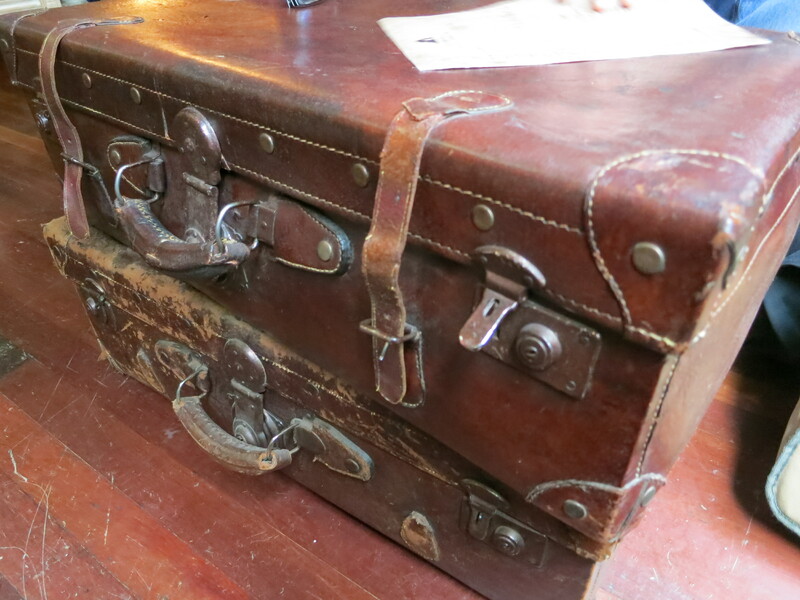 Coffee table made from two old leather suitcases. There are three main rooms. Each decorated in varying themes of Sherlock Holmes meets old England. The entry room is painted all green with the quintessential red London bus photo on one wall. 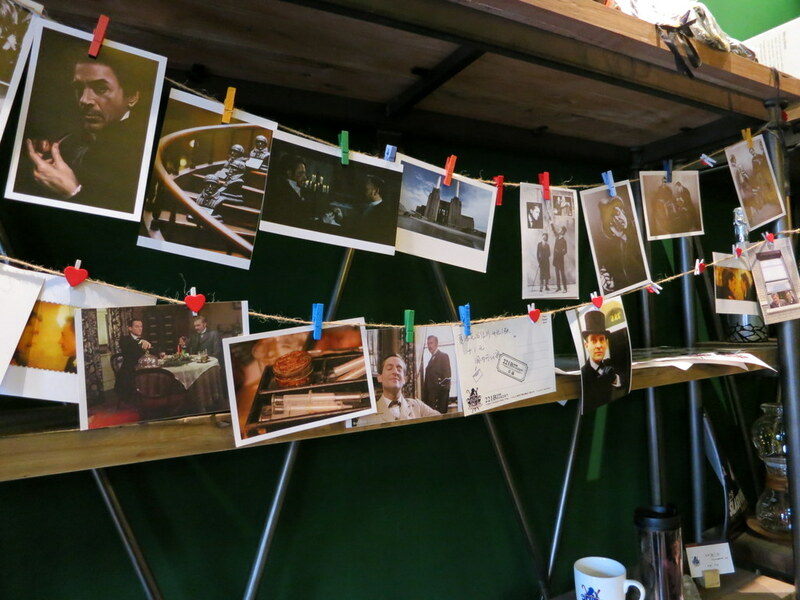 Photographs and random Sherlock paraphernalia line the walls and fill the shelves. The next room is maybe made to more closely resemble a British sitting room with a giant table, framed photos, and large-print wallpaper. The last room is the most Sherlock of them all (and where we got our table!) 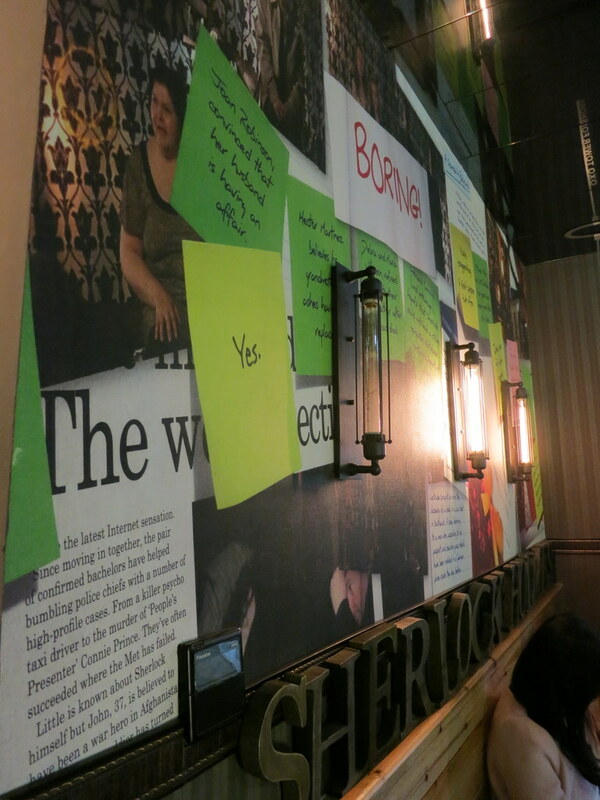 with custom-made wall-paper filled with Sherlock quotes, sticky notes, clues, and other objects that I’m guessing come from various stories or shows. Sherlock quotes and clues line the walls. If the weather is nice they even have a small outdoor porch that also has seating. Maybe something to go back and enjoy during the 2 weeks of Shanghai Spring. The menu was decent carrying an assortment of coffee’s, teas, drinks, desserts and waffles (they were out of the waffles when we visited :() all priced about the same as most cafe’s in Shanghai (¥15-¥38 per drink, ¥35-¥45 for desserts/waffles). We tried the Hot Chocolate, Sea Salt Cafe Latte, Caramel Cafe Latte, Carrot Cake and Cheese Cake. The coffee was good (and came in a Sherlock mug) although neither Justin nor I could taste the “flavor” that we had added. I was especially impressed with their desserts. Both the Carrot Cake and the Cheese Cake tasted like American-style baking (a fine feat if your used to Chinese versions of western desserts that are prolific in Shanghai). After a short while the rush subsided enough for us to feel at ease sipping on our coffee and slowly eating our desserts. It didn’t take long, however, for the people to start pouring in again—making me feel like our table was being anxiously watched by hungry vultures waiting for their turn to bask in Sherlock-y-ness. Luckily, by this time, it was also about our time to head out. Little did I know there is quite the fascination with Sherlock in China! ‘“…since it’s called Sherlock, I feel I should at least give it a try,” says Zhao Mengdi, a 24-year-old civil servant sitting in the cramped cafe, which was opened six months ago.’ (Shanghai Daily). Sherlock Holmes paraphernalia line the shelves. Order numbers are kept secure by the black top hats. Various London locations bedazzle the ceiling. This place looks awesome! Do they have a lot of themed restaurants and cafés there? Hi,I read your new stuff named “Sherlock Themed Cafe – Wander Wonder World” daily.Your story-telling style is awesome, keep doing what you’re doing! And you can look our website about love spells.